In a previous edition of Knitter’s Notebook, I put out a call for wool words, made-up words that enrich our knitting lives and help us express all that we make and love. I am happy to report a rich and robust response! In gratitudiknit, I’ve assembled a list of wool words that readers posted. 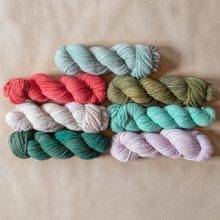 Test them out with your own stash of knitters. Practice pronouncing strickenfreude and strickfreunde in the bathroom mirror, and then, have some linguistic fun when you talk about your knitting. Shout them out loud when your neighborhood high plains knitter trots by. 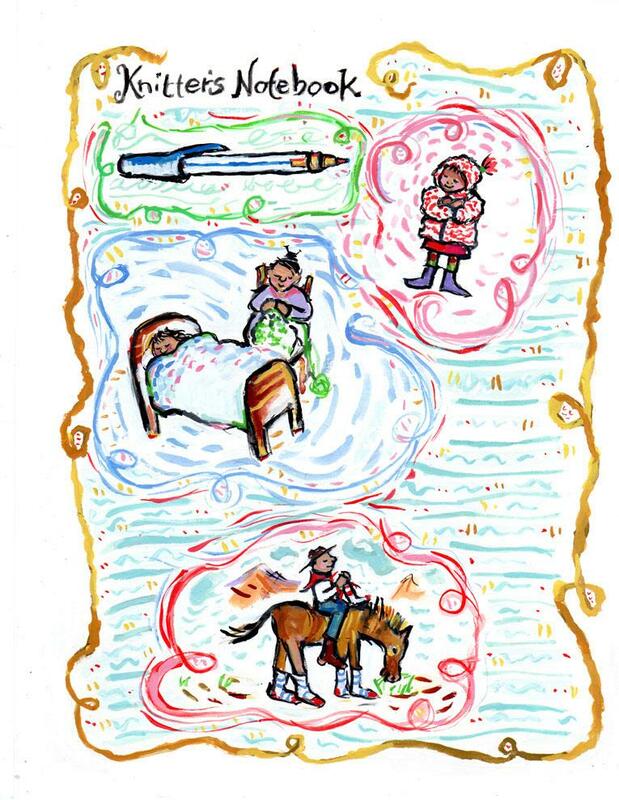 Write about your memorystitch, lovehugs, and sadknits. Hum them in your woolery. 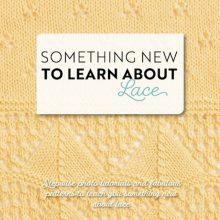 awe: wonder and amazement [about knitting, knitters, handknit objects]—Vicki. I’m “in awe” that you made such a beautiful item. I’m “in awe” that you took the time to create this for me. a cozy of knitters [collective noun] A group of knitters.—K.T. Much to her delight, a cozy of knitters was gathered around the campfire. 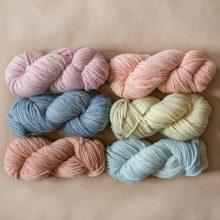 We nearly burst with gratitudiknit when we received her gift of wool, unspun and rich with possibilities. 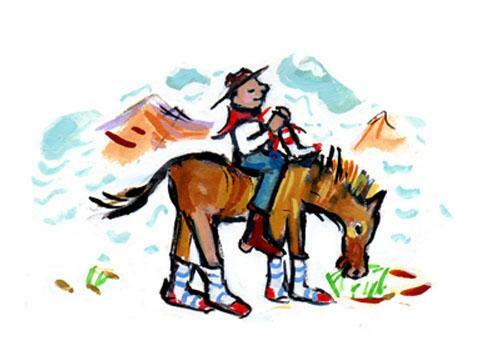 She adored Clint Eastwood, the famous high plains knitter, and never missed a chance to catch a glimpse of him knitting on horseback. She left everything else behind; taking only her favorite hugknit, the blanket her father knit for her when she was a baby. Grandmother chose a pale rose for the joyfulknits she made, two matching cardigans that her little granddaughters wore to their mother’s wedding. 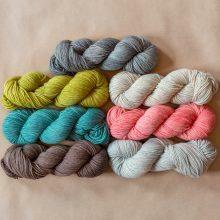 Knittinsmitten, she filled her closets with skeins of alpaca, merino, and cashmere. 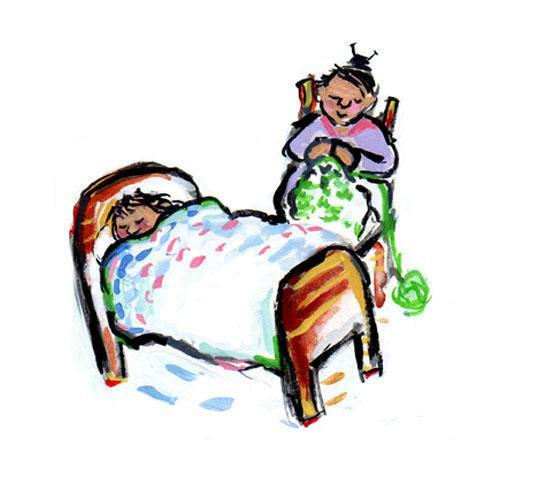 After the story, the water, and the night-nights, I’d sit on the corner of my girlie’s bed with my needles and wool for her knitterby. 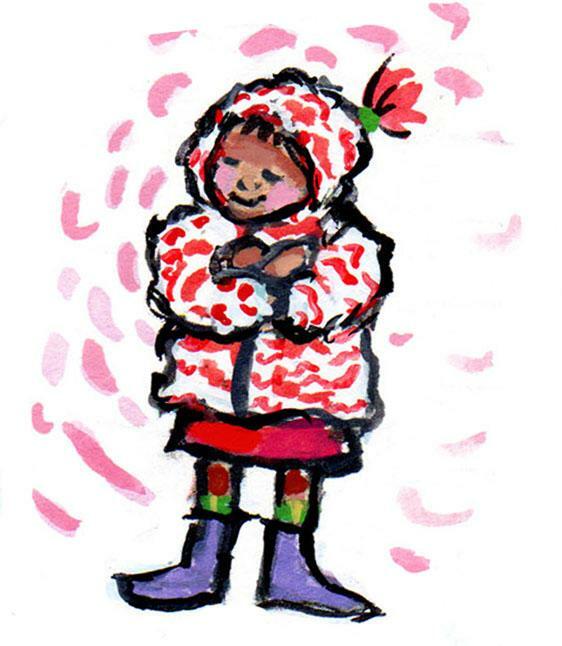 She suspected her favorite sweater had been knitlifted from the dry cleaning pile. After frogging the lace shawl, he cast on again, and soon was in knitting nirvana. A kindness of knitters was greeted by a parade in their honor. 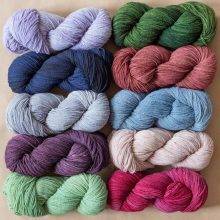 knitgape (nit-gä′pā):A love that encompasses both knitting and receiving knits.—Sarah W.
She slipped the shawl on the stranger’s shoulders, the spirit of knitgape entwining them. He was a keeper, and knitworthy, to boot! We wrapped our baby gently in the softest of love hugs, and took her home. Her loveknits could warm the coldest hearts. She could never give away the sweaters her beloved grandmother knit her, every bit of them was a vivid memorystitch. The mommyhug sweater she knit the boys in her life gave them the courage to be brave. He was a young homesick sailor when he received his favorite peaceknit, a sky blue scarf his mother made him to keep him warm at sea, and soothe her own troubled soul. It was a tough time, and the lucky ones were those with a portable hug, wooly and warm on their shoulders. One by one she mended and washed the returnknits, still rich with memory of her children when they were young. I made a sadknit to wear to my dad’s funeral; it had a rainbow stripe running through it, because it would have made him smile. I love my family dearly, but when they lose a knit I made for them, they’re on my shknit-list for a while. She looked with strickenfreude at the Savage Heart Cardigan; it was the sweater of her dreams. Turning the heel of her lacy sock was a moment of pure strickenfreude. She enjoyed knitting alone, but she preferred strickfreunde. A swatch of knitters meets every Saturday morning at Home Ec Workshop in Iowa City, Iowa. How could he forget to pack his warmthfuls? She took the Marie Kondo pledge, emptying wool from the closets, the drawers, and the hiding places in the cupboard. 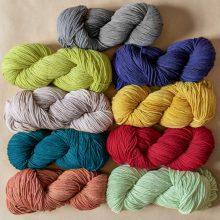 One late fall evening, on a unplanned visit to her local yarn store, she whipstashed, refilling her home with wool. Like an owlery, the woolery is the place our wool inhabits. Note: To the best of my ability, I have credited all wool words to those who submitted them. For clarity in the examples given, I sometimes took liberties by editing or recasting entries. Today only! 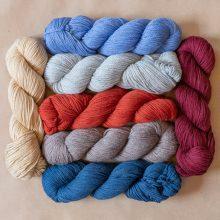 Celebrate MDK's second birthday with free U.S. shipping in the MDK Shop on yarns and books. Use code hbdmdk2 at checkout. Is there a book with knitting words/abbreviations in different languages? I sometimes get patterns when traveling in other than English words. I’ve used google translate then use abbreviations guide to figure out those words. Hope that helps. Bobette, you pose an interesting question. I am not aware of a book with knitting terms in different languages and I agree it would be helpful to have one. The closest one I can think of is an ancient Mon Tricot stitch dictionary with stitch directions in English, French, and German. One (kinda pricy) option: https://www.amazon.com/Knitting-Languages-Multilingual-Margaret-Heathman/dp/0942018117. A more intensive Google search will probably turn up more options. I understand a lot of people use google translate….and if there’s a chart, you’re mostly there already! Laura, Thanks for the link. It looks like the book is out-of-print and that is why it is so expensive. Googling is a good option. “Swatch of knitters” was one of my favorites too. I personally call the yarn that plops out occasionally at the beginning of a skein, the “yarn placenta.” My mom finds it, um, distasteful, but I think it’s hilairous. And I love the drawings! Thanks, I had a blast drawing horse. Every day is a joy when I open an MDK message…Thanks ! I agree, Ilove my morning MDK mail. 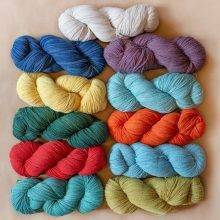 I first posted the word Yarnsulin on my blog back in June 2009:. Entereing the LYS, Kitten felt his Yarnsulin level rise only slightly, and knew that, while he was protected from buying every skein in the shop, this still was going to be a Big Haul Day. Yarnsulin is a keeper. Thanks for sharing it! Teresa, good to hear from you. I hope your mom and daughter enjoy the dictionary! Knitting. Words. Two of my very favorites! Thank you! Great to hear from you, Laura! Glad you enjoyed the post. I always LOVE these wonderful posts and particularly the sketches!! Is it possible to get info re: michelle’s Scarf in her photo??? Thank you, Donna! The scarf pattern is the Hakusa Scarf by Kirsten Johnstone. 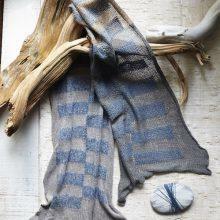 It is an asymmetrical scarf written around a combination of Habu yarns including their stainless wool. I altered the pattern a bit, mainly using garter stitch instead of stockinette. 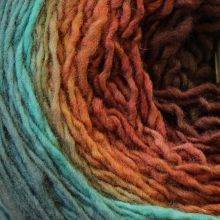 The yarn is Noro and I found the skien in a thrift shop. Sadly, it is a discontinued colorway. It is pretty perfect. Thanks for writing. My favorite knitting word is “procrastiKNITing”: to defer all other activities besides knitting !! I bought a reusable bag @ Jo-ann fabric & craft store that has this printed on it. Totally describes me!!! Funny. Oh, procrastiKNITing hits close to home. Thanks! Yarnwine is a great word and I love how you and your friends use it to include other activities. I am looking forward to some yarnwine today. Do you have an 800 number I can call to place an order? Thank you, Barbara H.
Barbara, did you want to order yarn? Butterknit is another terrific addition. I am going to keep my list open. I wonder how far we can go! Maybe an antonym for butterknit? A few came to mind…. Shrinky knit….how did my sweater get so tiny?!!! Woolastic….I thought I knew the gauge but?!!!!! Knitastic…..owning that you are the creator of that fantastic hand knit item! Woo-Hoo-l: Lookie what I found in the stacks at my LYS! Knitterly: as in people noticed her knitterly ways…. I adore knitterly and love to use it. So many good suggestions, we are rocking this wool words thing. Thank you. I think I just discovered a new one this afternoon. Knitravert: someone who is normally an introvert but gains energy from talking to other knitters. Knitravert is a perfect word and one that I think is much needed. Knitters give off so much energy when they gather. Thank you. 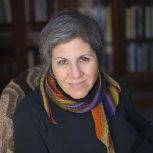 Hi Michelle, I recently finished your Home Companion book and was really touched. I could feel how much you miss your Mom. I enjoyed the book and when I was in Iowa City over Labor Day, I stopped in to visit Home Ec and the Knitting Shoppe (?). I love your drawings and your writing. Thanks for being a companion. Jan, thank you for your kind and thoughtful post. It means a lot to me. My mother would have loved all the ways knitters gather and knit in public, like at LYS, coffee shops and festivals. She loved being with people. How lovely that you were in Iowa City and stopped by Home Ec and the Knitting Shoppe. From the heart and the heartland. Yes! I’ll add it to the list under R, Rhinebecksgeboten. Thank you! Leanne, thanks for jumping in now with yarney goodness. Language is always elvoving.